This year has seen some of the largest protests in U.S. history with women marching against abuse and harassment and students rallying against gun violence. Teachers also revolted in a whole series of states to win wage increases and funding for public education and won real gains through collective action. In Seattle the housing justice movement led by Seattle’s socialist councilmember, Kshama Sawant, recently won a historic tax on Amazon and other big businesses to fund affordable housing. All of these struggles prove that we don’t have to wait for any wing of the corporate establishment to act on our behalf. Change comes from below. Events have also inspired a number of activists around the country to run for office on a clear anti-establishment agenda. Many were inspired by Bernie Sanders’s 2016 primary campaign and like him have refused corporate money and fight for affordable housing, free higher-education, and Medicare for All. In New York’s Congressional District 14, which covers parts of Queens and the Bronx, Alexandria Ocasio-Cortez, a member of the Democratic Socialists of America, is challenging Queens Democratic Party boss, and 19 year incumbent, Joe Crowley, in next month’s primaries. Ocasio was an organizer with the Bernie Sanders campaign and decided to run for office when she participated in the heroic Standing Rock struggle. Her campaign calls for Medicare for All, free higher education, corporate money out of politics, immigration reform (including abolishing ICE), criminal justice reform (including ending private prisons), solidarity with Puerto Rico, and more. Over fifty percent of residents in District 14 are non-white and almost half are immigrants. Like the rest of the city, the district has seen rapid growth of real-estate power and displacement of working people. Much of that process has taken place under the mis-leadership of Crowley who is the chair of the House Democratic Caucus and of the Queens County Democratic Party. He is one of the most powerful Democrats in Washington and New York State. Ocasio’s campaign is pushing back against Crowley’s corrupt machine in Queens which is completely beholden to corporate interests. She was able to get over 5,000 signatures to get on the ballot. She openly refuses to take corporate donations and has recently said that her campaign raised an incredible $200,000 from 8,000 individual donors (average of $25!). Just compare that with Crowley’s $3 million, with $241K from security and investment firms, $238K from real estate developers, $154K from insurance, and the list goes on. It is no wonder that working people in Queens and the Bronx find it increasingly difficult to afford an apartment; college education is more and more unaffordable; political corruption is rampant; and millions of Americans don’t have affordable healthcare. Socialist Alternative wholeheartedly agrees with the need to build a political force that really represents working people, but we believe this will require going outside the framework of the corporate dominated Democrats. But, as with the Sanders campaign two years ago, if people are fighting for change within that framework we will not stand on the sidelines but rather engage in the fight while discussing and debating the way forward. Considering the massive gap between corporate-backed Crowley and Ocasio’s working class message, it’s truly regrettablethat a series of labor unions, including the CWA which backed Bernie Sanders, and progressive organizations, particularly the Working Families Party which endorsed Cynthia Nixon for governor, have decided to endorse Crowley. This flawed strategy of trying to appease the leading candidate has only led the movement to water down its demands in order to get a few crumbs from establishment politicians. History shows that fighting back, rather than lobbying, is the best way to force the billionaires and their representatives to make concessions to working people. There are real opportunities for socialists to use and win elections as part of a broader fight for change. In Seattle and Minneapolis, Socialist Alternative has shown how socialists can build militant movements and force the establishment to make concessions whether we win elections or not. In Seattle, socialist city councilmember Kshama Sawant has just a single vote on the council, but rather than making backroom deals, she has used her position to build powerful movements and help win change in the streets. Sawant’s 2013 independent socialist campaign in Seattle was the only city council campaign in Seattle to support fast food workers’ demand for a $15/hr minimum wage — no other councilmember or candidate would support it until our campaign helped make it popular. We didn’t demobilize our campaign or stop fighting for $15/hour after winning the election. In fact, that was just the start of our fight. Sawant and Socialist Alternative immediately helped launch 15 Now which built a mass campaign that threatened to launch an independent ballot initiative for $15/hour if city hall couldn’t deliver. We won within six months of Sawant taking office and made Seattle the first major city in the country to chart a path to $15/hour. Our victory sparked similar efforts around the country. In Minneapolis, Ginger Jentzen’s socialist campaign in 2017 forced the issue of rent control firmly onto the political agenda. Despite not winning, Jentzen and Socialist Alternative used the momentum of our grassroots election to continued building a mass campaign for rent control, putting the Democratic-controlled city council on the defensive. We want to spread this model across the U.S.: using election campaigns and elected office to build mass struggles from below which history shows are the real motor force for change. Unfortunately, at their recent citywide convention, the Democratic Socialists of America in New York City voted against advising their own candidates to take the average workers’ wage if elected. But we would encourage Ocasio-Cortez and other left candidates to take up this important principle. Besides DSA, Ocasio is also backed by Our Revolution, Brand New Congress and Justice Democrats, three organizations who set as their target the transformation of the Democratic Party into a “people’s party”. 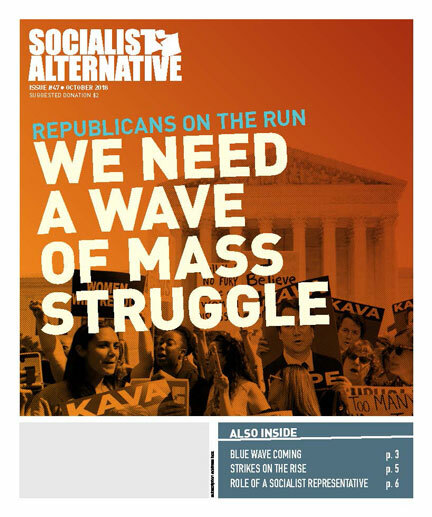 While Socialist Alternative supports the most ferocious struggle to bring down the leadership of the Democratic Party and sympathizes with any effort to fight the establishment within the party, we do not support the strategy of transforming the Democrats. The rigged result of the 2016 presidential primary, and countless other examples, show that the party leadership will use any tool in its arsenal to resist these attempts. To actually turn the Democrats into a “people’s party” would require creating democratic structures accountable to the membership, refusing corporate money, and actively building mass movements to fight for real change for working people and the oppressed. The corporate leadership uses any opportunity to demobilize genuine movements and would rather split or destroy the party than submit to such a fate. A far more realistic strategy is to begin now to sow the seeds for a new mass party of the working class, using campaigns such as Ocasio’s as a the first step. Socialist Alternative is working with Ocasio’s supporters to win the best result in the primary on June 26. It would be a political earthquake if Ocasio defeated the strongest Democrat in Queens who is also rumored to be the next Speaker of the House if the Democrats retake the chamber this fall. If she does win, we would encourage her to use the victory to lay the basis for a real struggle to win Medicare for All and build resistance to Trump by basing herself on building a mass movement on the streets, like Kshama Sawant has done in Seattle. However, there is also a real possibility that she doesn’t win. In such a case, we would urge her to not let the momentum behind her campaign get trapped within the framework of the rigged Democratic Party primary process. If we really believe in the strongest possible challenge to the establishment then this fight deserves to go all the way to November, when most people will be paying attention. This would allow Ocasio’s campaign to continue building and organizing a working class force in Queens and the Bronx to fight for a real alternative to the corporate-dominated Republicans and Democrats. If needed, it is absolutely legal and possible for Ocasio to continue running as an independent under New York election laws. The filing deadline for independent candidates is in July and her campaign has already shown it has the ability to get the required number of signatures. Campaigns like Ocasio’s highlight the growing opportunities to build powerful challenges to establishment politics. Given the historic crisis of U.S. capitalism, it’s highly unlikely the anger at corporate politicians can be reconciled within the framework of the Democratic Party and its entrenched pro-corporated leadership. We need our own party. We urge Ocasio to use her campaign to help lay the basis for such a party and we urge DSA and others to join together with Socialist Alternative to run 5-10 independent candidates in 2018 as part of an effort to build a new mass party of working people in the U.S.